Cohabiting couples are the fastest growing family type in the UK, with approximately 3.3 million in 2016. Unmarried partners often assume they enjoy the same legal rights as married couples but that is not the case. There is no such thing as a common law husband/wife. 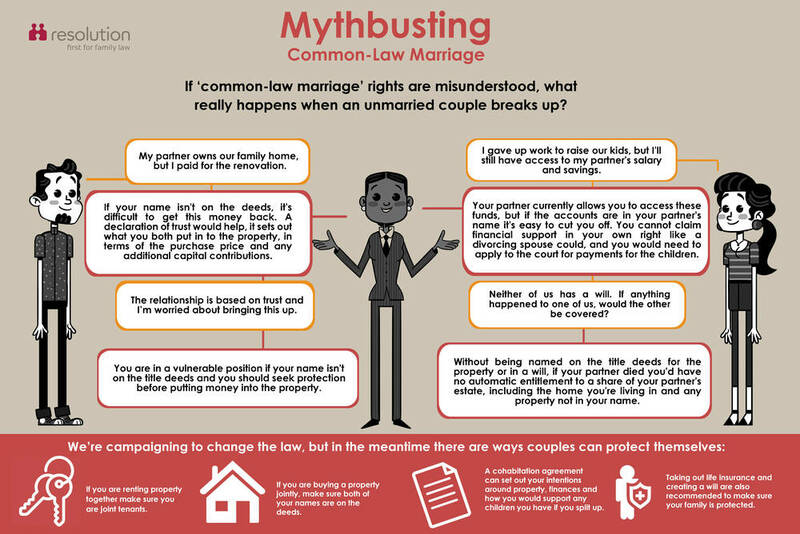 It is, therefore, concerning that a 2017 ComRes survey showed that only one couple in three knew there was no such thing as common law marriage. No matter how long you have been together, cohabiting couples are not afforded the same legal rights against each other as married people, whether in relation to maintenance, property ownership or pensions. It is quite possible that a person could find themselves with no financial provision following a lengthy cohabiting relationship. Equally, someone who has made the sole or main financial contribution towards a property could find themselves having to pay their former cohabitee half of the equity depending upon the way the property is owned by them. Having a cohabitation agreement that covers financial arrangements and how assets are to be divided if your relationship breaks down is an easy way to protect yourself. This is particularly important if you have children. A declaration of trust documents the shares each of you has in your property. If you and your partner split up in the future, this ensures you get back a fair portion of the proceeds of the sale. No one knows what the future holds. If you are not married or in a civil partnership and your partner passes away, it does not automatically follow that their assets will pass to you. Making a Will ensures that you will be provided for. Both Molly and Neville had been married (to other people) when they were young – too young in reality – ‘marry in haste and repent at leisure’ Molly’s mum used to say to her. Both had suffered tremendously in their divorce proceedings which were traumatic, expensive and painful. So Molly and Neville decided ‘never again’. Once bitten, twice shy. They just lived together very happily for 28 years until, when Molly was 60, she found out that Neville, who was now 71, had kept hidden from her, all these years, the secret that he loved to dress as a woman whenever she was not at home with him. She was mortified and, in spite of some counselling, she felt that, morally, the relationship had to end. She went to visit solicitors to see what could be done. What rights did she have? She remembered that she had divorced her first husband for unreasonable behaviour, and that was for, generally, being a slob – this was much worse wasn’t it? But, you weren’t married, advised the solicitor. You were just living together. You have no rights at all. What did you contribute to the family home? Molly just paid the utility bills, bought the shopping and the clothes as well as paying for their annual holiday to the Canaries. That took up pretty much all of her income. Neville, whose house it was, always told her he would pay the mortgage and that she need not worry her ‘pretty little head’ with that financial burden. I shall wait until he dies, thought Molly savagely. He always told me that he would provide for me in his Will. But, explained the solicitor, a will is what is known as a ‘peripatetic’ document which means that it can be changed at any time Neville wants. Rats, thought Molly, that means his sister might get the house that I have spent all these years lovingly furnishing and lavishing care on. It’s worth at least £600,000 and the mortgage finished when Neville reached 65 and got his state pension. I can’t get my pension until I’m 67. What about his other final salary work pension? That gives him an income of £2,000 a month, for heaven’s sake. Sorry, said the solicitor, you cannot have any of that either. Poor Molly: what a salutary lesson. There’s no such thing as a common law wife, no matter how long you’ve lived together. We can advise cohabitees as to how to best protect their legal position, including drawing up cohabitation agreements and advising how property should be owned. For more information, please contact our Family team who would be happy to advise you.